Guidance Counselling refers to a full range of interventions and learning experiences, developmental in nature, shaped by the core values of the Mercy Ethos, reflective of the school’s Wellbeing Policy, designed to assist all students. The guidance team in Mercy Mounthawk consists of three fully qualified guidance counsellors, Ms. Betty Farrell, Ms Mairéad O’Mahony and Ms. Sinéad Muldoon-Walsh, who work collaboratively to provide guidance to all in our school community. The Guidance Department aim to provide a caring and supportive service under the strands of Personal and Social guidance, Educational Guidance and Vocational Guidance. Personal and Social Guidance and Counselling encourages developmental skills crucial to the students’ development. Personal guidance may be part of the developmental learning of students or it may result from a time of personal crisis for the student. Personal Counselling usually takes place on a referral basis. Students may be referred by parents, staff, management, other students or they may self-refer. 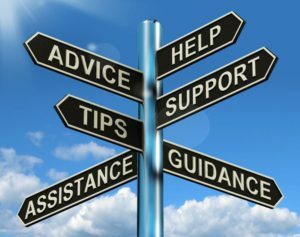 Educational Guidance and Counselling is developmental and includes areas such as subject/course choices, subject level, motivation and learning, study skills, exam techniques, personal organisation and psychometric testing. The career and vocational guidance provides students with information on the jobs market, job opportunities, vocational education and training, further education, job and interview preparation, career research and career/course information. The guidance counsellor assists students in understanding applications to college. Students attend various career events e.g. Open days, Higher Options, Guest Speakers etc. In order to maximise efficiency in relation to delivery of information regarding courses and subject choices, emphasis will be placed on parent information sessions (dates in the school calendar). At the end of these sessions the guidance team will be available for consultation. 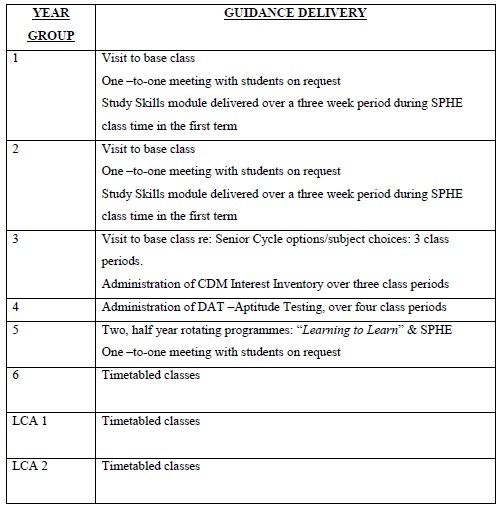 Guidance will be timetabled for 5th and 6th years, and all 6th year students are provided with a one-to-one guidance appointment. Counselling is a key part of the school guidance programme and may include personal counselling, educational counselling, career counselling or combinations of these. The Guidance Team form a part of the Pastoral Care Team in the school which is instrumental in providing personal counselling to all students in need. The Pastoral Care team in the school meets once a week and consists of Deputy Principals, Guidance Counsellors, Year heads and other staff members with Pastoral training. The Deputy Principals liaise with Tutors and Year heads to prioritise students with specific pastoral care needs and manage the provision of care to these students. Parental permission will be sought for any continuous personal counselling with a student. • Written parental permission will be required for involvement in this process. • The Pastoral Counsellor will agree on the process with the student going forward. • The counsellor will specify the limits of confidentiality. Confidentiality is within the bounds of the Pastoral Care team, counselling supervision and the counselling supervisor. If the client or anyone else is at risk, the pastoral counsellor will be obliged to report this to the school authorities. • No student will be required to attend supportive counselling against his/her will. The Scope of Pastoral Counselling. The Pastoral Counselling provided in the school is not of a clinical or diagnostic nature. If, in the opinion of the Pastoral Care team, the student’s needs fall beyond the professional expertise of the team, a recommendation will be made to the parents/guardians regarding the availability of appropriate external services and referral will be discussed as appropriate.